I’m back! The last time I posted I talked about some mini-goals for September. One of them was to complete some items for a friends tea party in the woods showcase that she’s hosting on her facebook page. I’m pleased to say I finished them! 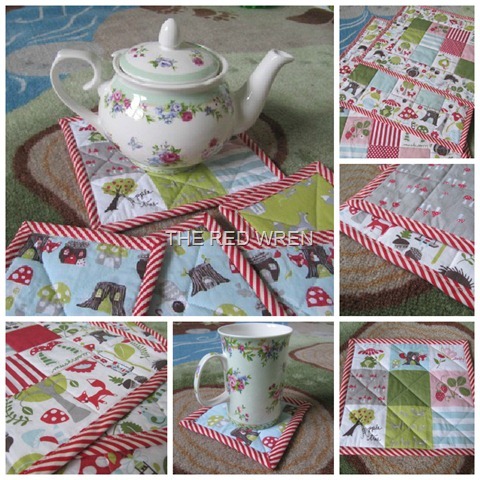 There’s a set of four woodland themed placemats, and a tea pot stand with four matching coasters. I am so thrilled with how they have turned out and of course I’d like to keep them for myself. Luckily I have lots of left over fabric. Let’s talk about the binding. These are the second lot of things I’ve bound with stripes, the first being Elijah’s ‘Wee Play’ quilt, and I have to say they’re my new favourite thing! I can see striped binding featuring quite heavily in my Christmas collection which I’ll be launching soon. If you’re interested in my items you can pop into the showcase tonight at 8pm (AEST). (Link will take you to a Facebook page). Today I’m up to something completely different. I purchased a copy of Lissane Oliver’s ‘Sorted!’ and will be begging the process of getting, well, Sorted! Good on you for ticking off this mini goal! Love love love them! Lovely goodies, nice work! Ohh! I’ve been meaning to get/read that book for ages, I’ve heard good things!